Source: [Preorder] Pop Sixties by Donna Loren—Tiki Sale! Source: Thrillville: Introducing THRILLVILLE PRESS! I read the Spectro Pop site is recommending this highly. 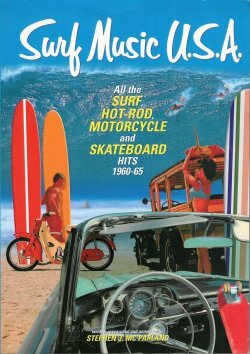 And the author, Stephen J. McParland, has been a prolific historian of the subject of Surf-, hotrod-, Skateboard-, Motorbike and related early to mid 60s musical styles since 1979, when he started his California Music magazine, from Australia. Check out CMusic books while we’re at it! I checked this book out a while back and I confirm it’s a must have. Here’s a quote from the New York Times. The cool was born in New York. It was in Manhattan that Miles Davis and the nine-piece group he convened in the late 1940s forged a tightly understated alternative to the hot expressionism of bebop and recorded the hugely influential tracks later collected in the album “Birth of the Cool.” But it was in California in the 1950s that cool jazz and cool art in general took root and flourished. The story is well told in “Birth of the Cool: California Art, Design and Culture at Midcentury,” an exhibition here at the Addison Gallery of American Art. Organized by Elizabeth Armstrong, chief curator at the Orange County Museum of Art in Newport Beach, Calif., where it originated, the show examines cool style of the ’50s in several disciplines, including painting, furniture design, architecture, film and photography.